France does not expect an early exit from Mali, even as the cost of intervention is rising, says the country’s United Nations (UN) ambassador. Gerard Araud, France’s UN ambassador says that he does not anticipate UN Blue Helmets to take over a peacekeeping role in Mali until at least April. 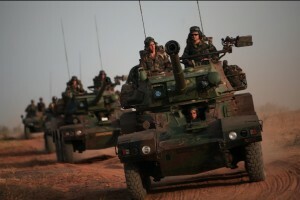 Earlier this week, Jean-Yves Le Drian, France’s defence minister, announced that French troops were involved in “very violent fighting” in the Adrar des Ifoghas mountains of northeastern Mali. The French defence minister estimated that military operations in Mali have cost the French government over 100 million euros ($131 million). “All these figures will be presented to the National Assembly’s Finance Committee who shall be kept informed every week about the situation in Mali,” Le Drian told RTL radio. According to the minister, France’s annual budget for external operations stands at 630 million euros. France has poured 4,500 soldiers into the West African country to help oust Islamist rebels. Asked about a possible start to pull out troops in early March, Le Drian said it was “difficult” to fix an accurate schedule to send soldiers home. “We are committed in liberating (Malian) territory. The beginning was very quick and we are now at the heart of the conflict. Fighting is violent in Adrar des Iforas, north Mali and we must completely liberate it,” he said. “If things go normally, we can start (troops’ withdrawal) from the end of March,” he said.